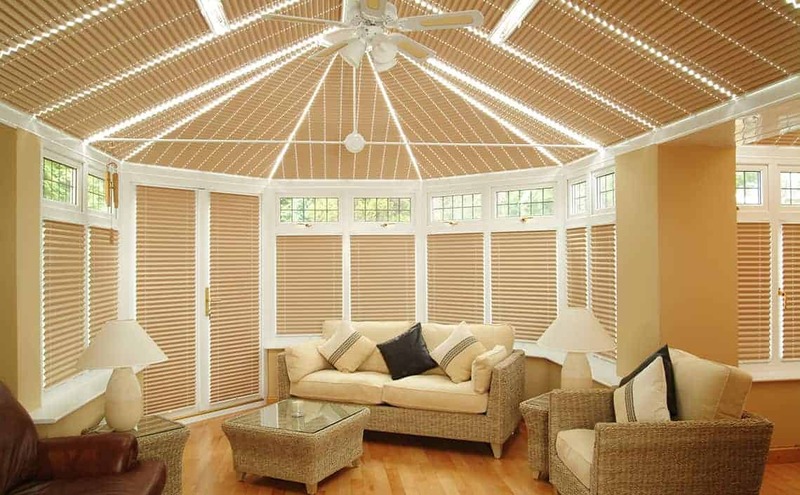 Superb quality pleated, roller or pinoleum blinds for your conservatory roof. Electric, remote control options. FIVE year guarantee included. 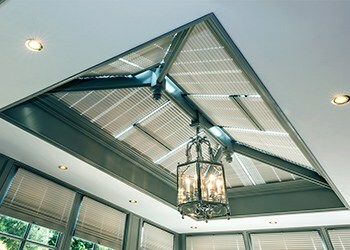 Oakhurst’s blinds for roof lanterns dramatically improve any heat loss and add aesthetic appeal. As an independent company Oakhurst can offer a comprehensive selection of fabrics. FREE Home consultation. FIVE year guarantee included. 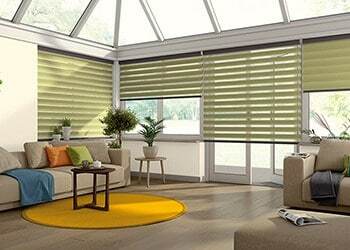 Pinoleum blinds made to the highest specification. UNIQUE fabric covered hardware. FREE consultation. Five year guarantee included. Motorisation available. 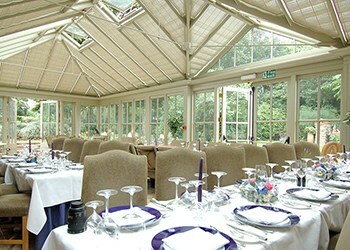 As a recognised pioneer and leading innovator Oakhurst’s pleated blinds for conservatories are second to none. Made to measure plantation shutters for windows and conservatories. Oakhurst offers a wide range, measured and perfectly fitted. 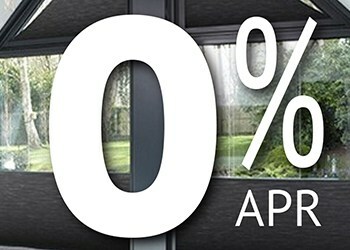 Enjoy your conservatory all year round with our made to measure conservatory blinds ranges. They will exclude excessive light and heat and will keep you warmer in the winter and cooler in summer. 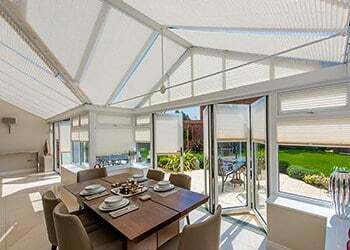 Our bespoke conservatory blinds ranges are designed to fit your conservatory perfectly, including pleated blinds, pinoleum woodweave blinds, roller blinds, Roman blinds and Venetian blinds – all are made to be a perfect fit for conservatories of all designs and dimensions, bringing privacy, style and beauty to your living space. 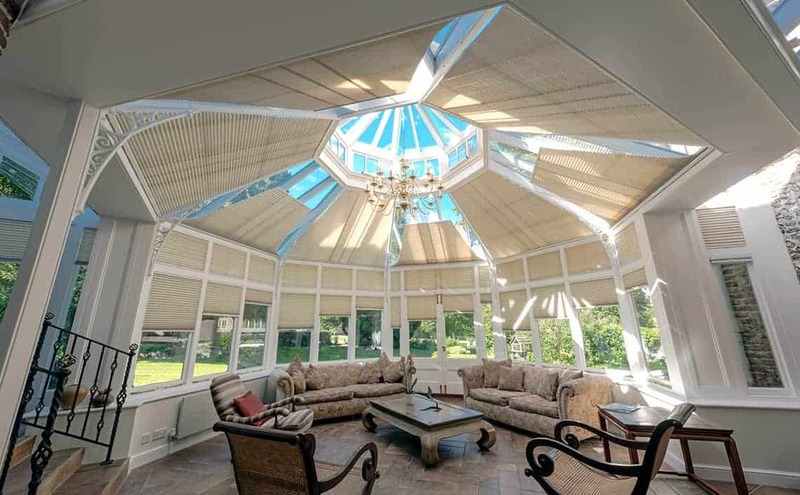 Supplying high street names such as The John Lewis Partnership, Oakhurst is a pioneer in the manufacture of pleated conservatory roof and side blinds. 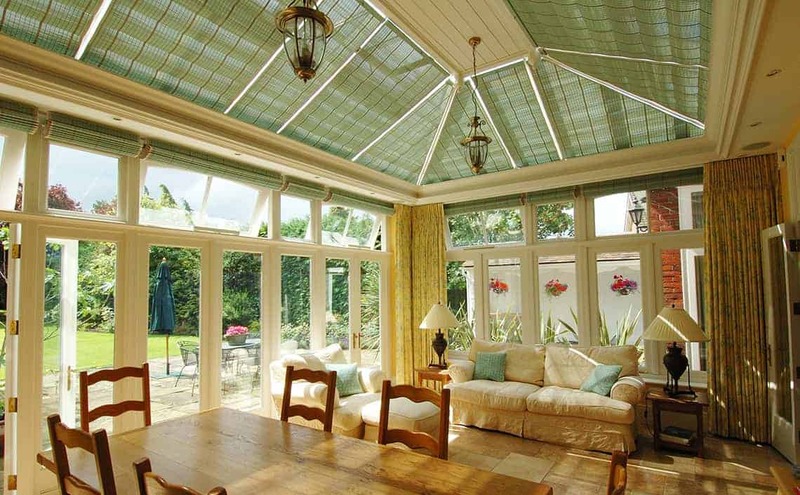 These are the ideal solution for conservatory roofing, as they are easy to manoeuvre and will accommodate the most demanding conservatory designs. 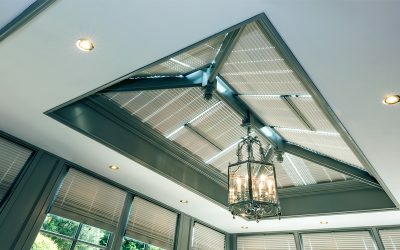 With a large variety of pleated fabric ranges, styles and colours our conservatory blinds will suit almost all design tastes and budgets. 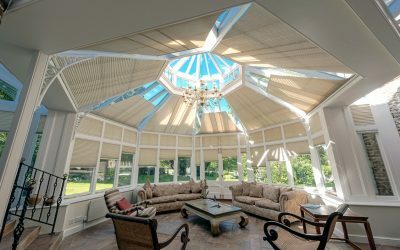 For those looking for an alternative to pleated fabrics we also measure and install pinoleum/woodweave roof and side blinds and roller blinds for the roof and sides of the conservatory. We have a comprehensive range of colours and finishes to suit your taste. Using state-of-the-art technology, motorised blinds are reliable, convenient and quiet to operate. All our products use high-specification components engineered to last and powered by Somfy motors and controls. We can install our motorised system directly into your power supply at home or we can install battery operated blinds with the batteries recharged from a solar unit. 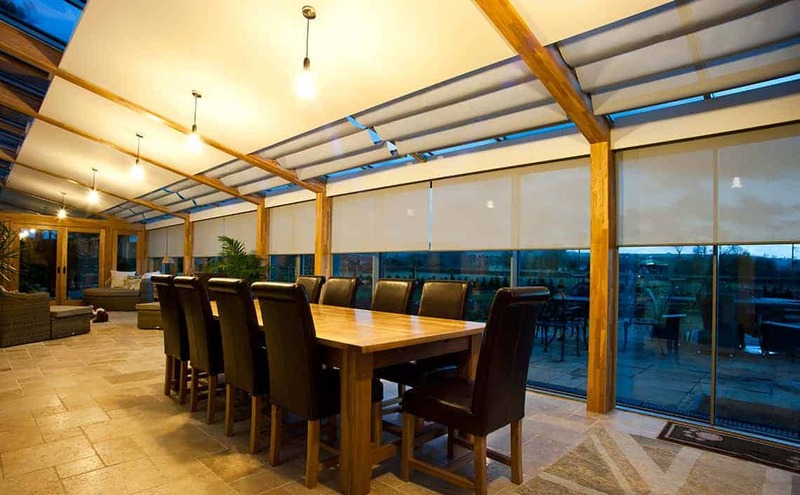 Choosing a high specification system means that you will be able to change settings and control the blinds in groups rather than individually. You can also choose between two types of handset; the Chronis is even programmable or why not opt for controlling your blinds from an app on your smartphone or tablet. Large installations with several blinds particularly benefit from our motorized options, making the opening and closing of blinds easier, especially where blinds are difficult to reach. 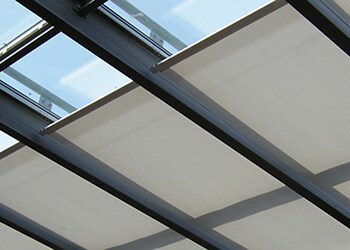 Electric blinds are available in all our product ranges (pleated, pinoleum and rollers) for both roof and sides. 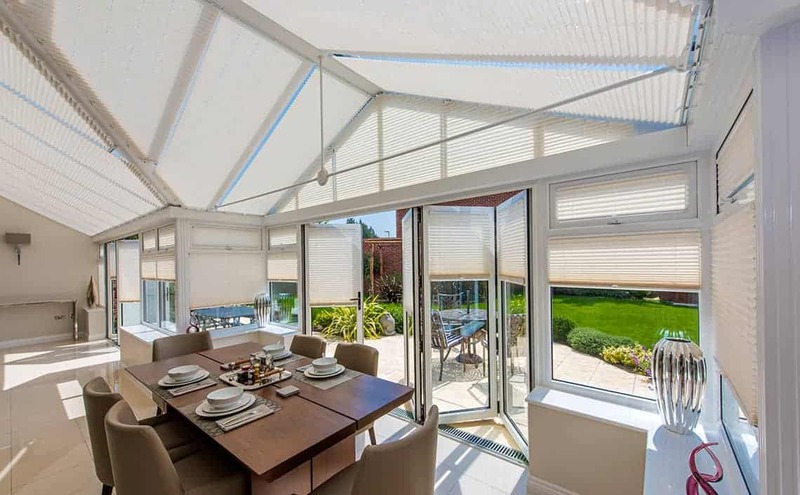 We can cope with almost any design of conservatory, including Orangeries, Lanterns and Glass Extension as your our conservatory blinds ranges are tailor-made to fit exactly.